Economically priced for quantity purchasing! Non-glare lenses ensure your message is viewable from all angles! 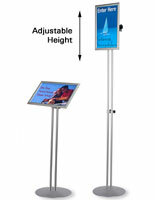 Double-sided display broadens the scope of your advertising! 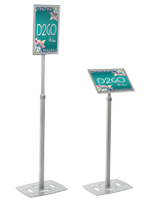 These sign frames are economically priced to offer an affordable advertising solution. 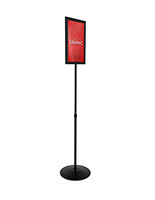 These advertisement displays, also known as poster stands, are perfect for restaurants, business lobbies, schools, museums, and more. Each of these sign frames can hold anything from a graphic poster to a menu, directory listing, schedule of events or informational sheet. 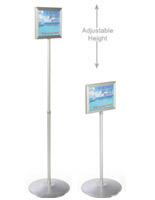 These double-sided displays are perfect for communicating virtually anything to customers or patrons on an 11" x 17" poster. The economical price of these sign frames makes them ideal for placing throughout a retail store to advertise sale or clearance events. 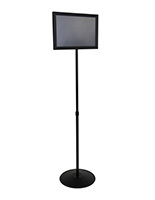 Restaurants and other dining facilities often use these pedestal stands to direct patrons to seat themselves or wait to be seated. 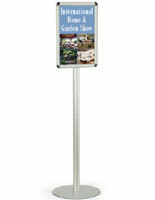 These satin silver poster holders, sign frames feature a 14" diameter pedestal style base. 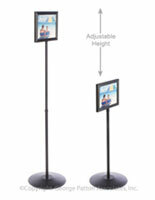 A single upright pole telescopes, so the top of the framing can extend anywhere between 45-1/2" to 69" high. 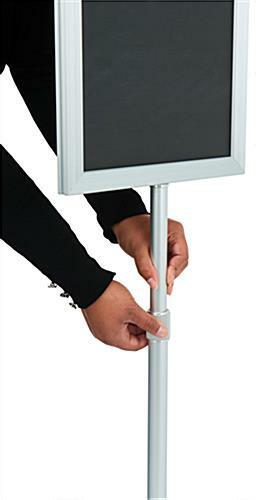 The 11" x 17" sign frame displays menus, advertisements or other images on both sides of the holder. A 1/4" thick black expanded PVC backer ensures your images stand upright without sagging, while non-glare plastic lenses ensure the message in your sign frames is visible from all angles. This backer could also be brought to your local sign shop to be silk-screened with vinyl lettering, to create a more permanent message. 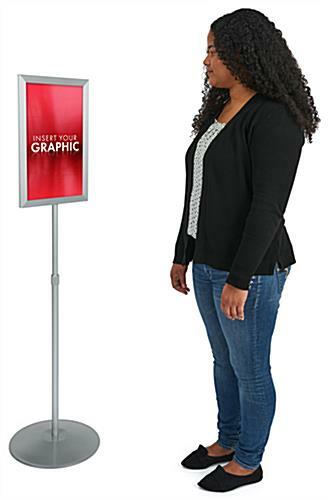 To insert graphics into your sign frames, simply pull out the backer and two lenses, sandwich each of your posters between the backer and a non-glare lens, and slide into the framing. 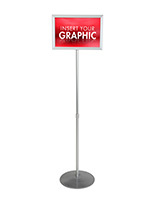 Change out graphics in just seconds with these sign frames! These poster displays ship unassembled. 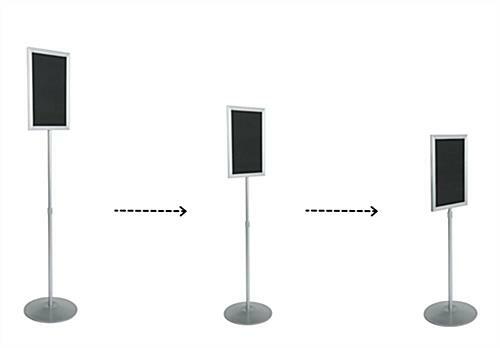 These sign frames can be put together by one person in just a matter of minutes. Great sign - exceeded expectations! The sign is perfect and exactly what we were looking for. The quality is good (doesn't feel cheap) and the price point was very reasonable. Our sign faces slid nicely into the pre-made board with the nice covers, creating a very professional look. Thank you! You're very welcome, Rena! Thank you so much for your excellent review! We're so happy that these sign stands exceeded your expectations and proved to perfect for your needs. We appreciate your positive feedback, and we hope you'll shop with us again soon! This sign stand is very sturdy and easy to use. It is better than I expected. It is weighted so it can't fall over and I can set it at any height I need. Super east to store away in a closet when not in use. Perfect! Exactly what we needed. Very sturdy. Will be ordering more. Thanks for the great review, Ginny! Great sign holders for product info! We use these as product information signage next to our product on the dealership floor. Easy to change out the signs when specials change. It was very easy to put it together, and it is very sturdy! Love the convenience of being able to change the signs for our needs. Thanks for the feedback, Liza! Your photo looks great!